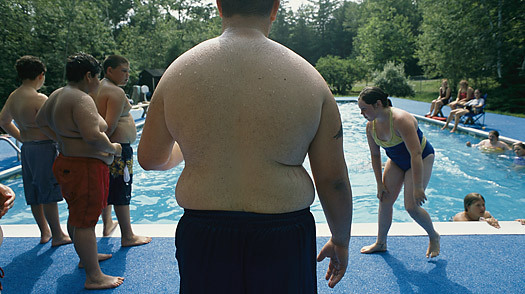 25 million kids in this country are overweight. That's 1 in 3 kids. There are things parents can do to help their kid to lose weight. Researchers are finding that simple substitutions at meals and easy changes to recipes can dramatically cut the number of calories kids eat. Give kids 1% milk instead of whole milk. Serve canned fruit in juice instead of in syrup. Make macaroni and cheese with 1% milk and reduced fat butter. Serve low fat yogurt with fresh fruit. Buy reduced-sugar cereals and serve them with 1% milk. The researchers found that when kids were served the reduced calorie foods, they ate about 400 calories less and the kids still liked the taste of the foods. The kids in Norway get bigger and bigger every year.. Too much time watching Tv and playing games. Is skim milk not favored? Skim milk is even better! Less calories and fat. If kids are used to drinking whole milk, the low fat milk would probably be less of a change in taste for them versus the skim milk.